The German Rimowa is located in Keulen for more than 115 years. All the 200 steps that are needed to make a suitcase, are done by hand. Only like this, Rimowa is able to guarantee their self-set high quality norms. 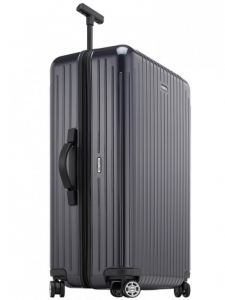 Rimowa is known for its silver coloured aluminium ribbed suitcase: called Topas. Rimowa wants to be the preferred luggage carrier of every traveller that associates traveling with special expectations, worldwide. Underneath we present a small selection of our Rimowa collection. Please call our office, if you are looking for a special type of Rimowa suitcase, we are always able to order it for you. Paolo Salotto offers the largest Rimowa suitcases range of The Netherlands. At our Leather & Travelgoods shop at Schiphol Plaza you will find a Rimowa corner with over 100 different Rimowa suitcases, all in stock.